Napster chief executive Bill Patrizio has big plans for the future. Today, there are 175 million or so music subscription subscribers around the globe, he told a Midem audience in a June 7 keynote Q&A at the annual music industry conference in Cannes, France. The number of paying customers is going to balloon in the next decade, he said – something with which any market researcher and industry executive would concur. Far more people will pay money to stream, anytime and almost anywhere, music from catalogs with 40 million or more songs – and especially new, favorite music people mostly want to hear, Patrizio continued. Wherever the subscription business goes in the next decade, Napster wants a seat at the table. Patrizio, who moved from Napster’s interim to full-time CEO in February, doesn’t seem fazed that his company is playing in a market governed by far more massive, better-funded competitors. Instead, Patrizio envisions Napster capturing a small but meaningful share of a $20 billion or $25 billion global recorded music market in a decade or so. Patrizio admitted the largest services would command 80% of the streaming market in the future, but eating scraps isn’t necessarily a bad idea: 20% of a $25 billion streaming market is a $5 billion opportunity. The best of the second-tier companies, therefore, can watch more substantial services like Spotify and Apple battle from afar and run a successful business on a piece of a $5-billion market. The obvious question, however, wasn’t adequately answered during Patrizio’s Q&A: can Napster compete? Napster – an outgrowth of the peer-to-peer service that operated under the Rhapsody brand in the U.S until 2016 – can survive if it benefits from the current streaming bonanza that’s helped push the global industry to double-digit growth in 2017. Napster’s true progress isn’t known, however. 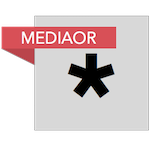 The company doesn’t release the internal metrics – such as revenue or subscriber counts – that would give transparency to the company’s operations. Although Napster is not a publicly-traded company, some essential information about its financial performance is hiding in plain sight: Real Networks, a publicly traded company, owns 42% of Napster and included some figures, reflecting Napster’s total performance, in its 2017 annual report submitted to the Securities and Exchange Commission in February. The short version: Napster missed the party in 2017. After climbing steadily until 2016, Napster’s revenue sank from $208.1 million in 2016 to $172.4 million last year. As global streaming revenue jumped by about 41% last year, Napster was unable to capitalize on swelling demand that propelled some of its larger competitors. 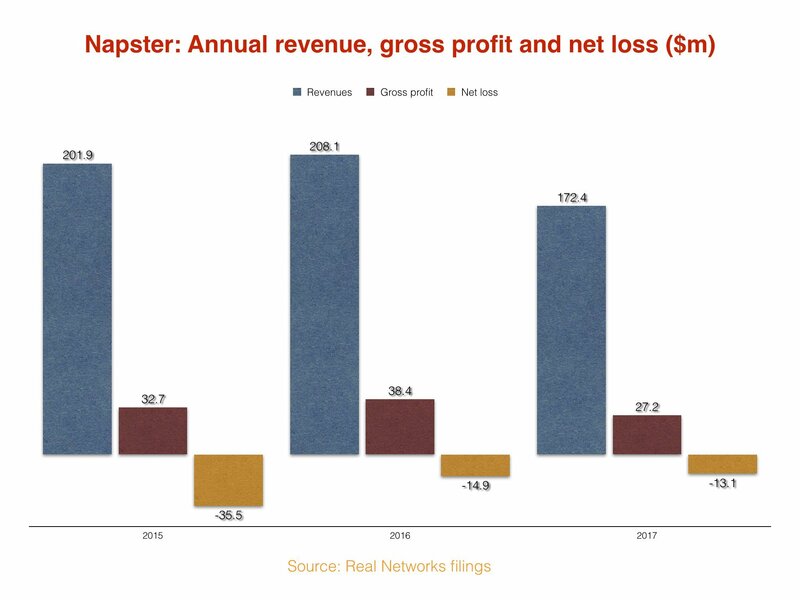 The company’s bottom line showed evidence of cost-cutting and improved efficiency, however: Napster’s net loss improved 63% from $35.5 million in 2015 to $13.1 million last year. With a revenue drop probably came a decline in subscribers. Has that happened? Napster stopped releasing its subscriber count three years ago. However, the publicly available information allows for a fair estimate. Napster used to announce when it reached specific mile markers. Based on that information, along with given revenue figures, it’s possible to estimate Napster’s average revenue per user. The company announced it passed 2.5 million in February of 2015 and 3 million five months later in July. Come to the end of 2015, Napster said it had almost 3.5 million subscribers. At $201.9 million in revenue in 2015 and an estimated 3 million median subscribers, average revenue per user was $5.61. An estimate for 2017 subscribers depends on ARPU, since revenue is known. Should a 2015 ARPU be used to calculate 2017 subscribers? Not if ARPU had changed. It’s possible. For instance, Spotify’s ARPU fell from $7.32 in 2016 to $6.28 in 2017 due to discounts such as student and family plans. But let’s assume Napster’s ARPU remained steady over two years. At 2015’s $5.61 ARPU, Napster would have had median subscriber counts of 3.09 million in 2016 and 2.56 million in 2017. But keep in mind those are the median counts, not the year-end counts. With revenue dropping, Napster would have had fewer than 2.56 million subscribers by the end of last year. There’s no reasonable combination of numbers that would suggest Napster, like its peers, is sharing the immense growth in paid streaming. 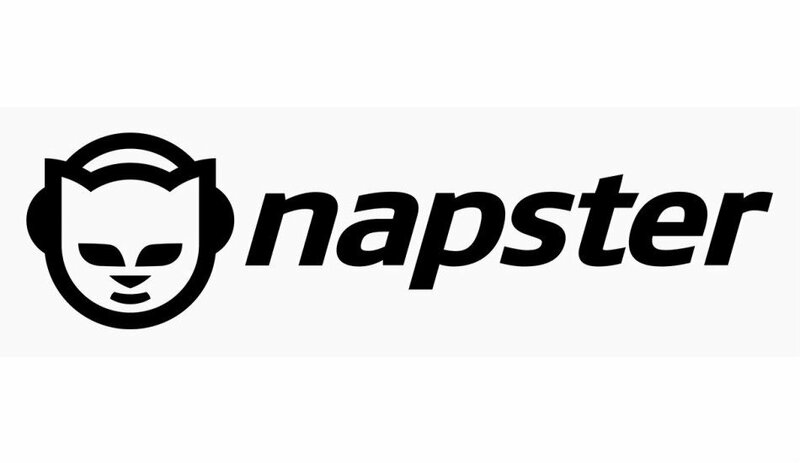 As Spotify and Apple Music have exploded, it appears Napster has retreated. Spotify subscribers grew from 50 million subscribers in February of 2017 to 75 million at the end of March 2018, a 50 percent jump in 13 months. Apple Music reached 40 million in April, fewer than three years after its launch. Pandora has about 5 million subscribers to its premium and ad-free radio services. The subscription music business is tough financially. At best, subscription service will pay rights owners around 70% of revenue – but it can go higher. In 2017, after paying rights holders, Napster was left with $27.2 million. Napster has occasionally needed help and twice received support from its two largest shareholders, RealNetworks and Columbus Nova Technology Partners. In December 2016, Real Networks and Columbus Nova each loaned Napster – then Rhapsody – $5 million for “general operating purposes” portioned out as $3.5 million in December 2016 and $1.5 million the following month. That year’s net loss on paper was $14.9 million. More loans came in the second quarter of 2017 when Napster defaulted on loans to senior creditors. As a result, to loans from RealNetworks and Columbus Nova defaulted, too – a cross-default in financial parlance. The default didn’t necessarily arise from a failure to pay. A default can occur when a company misses a covenant like, just as examples, minimum revenue or a maximum revenue-to-debt ratio (there’s no evidence Napster has outstanding long-term debt). In any case, the lenders gave Napster time to remedy the situation. In October, Napster obtained financing from a new lender to pay its existing debt. Napster also acquired a revolving credit facility that RealNetworks and Columbus Nova have guaranteed up to $2.75 million each. As of February, Real Networks has not paid anything under the guarantee. All this is not to say Patrizio can’t turn things around. Two themes he repeated at Midem were innovation and segmentation. As for coming tech innovations, Patrizio believes 5G wireless download speeds will allow for new features and experiences. Speaking about segmentation, Patrizio pointed to an enterprise business to complement the core consumer product. Partners could open new revenue stream—think voice-activated speaker manufacturers, cable companies, mobile carriers, hip clothing stores, grocery chains not own by Amazon et al. And although it went unmentioned, Napster partnered with SoundMachine, a commercial background music company, to provide a music subscription service for retail businesses. As a phrase of the financial world goes, past performance is not an indicator of future outcomes.